Set to composer Thomas Adès' 2005 violin concerto Concentric Paths, Outlier was created for New York City Ballet's Architecture of Dance Festival, and was McGregor's first original work for an American dance company. 'In 2010 I was asked to create a new work for the New York City Ballet in their architecture and dance series. The Philip Johnson building that houses the David H. Koch Theatre and is home to the New York City Ballet felt like a natural place to look for inspiration. Johnson was not only a great friend of George Balanchine and an influential architect, he championed the architects of the Bauhaus, like Walter Gropius and Mies van der Rohe, in the U.S.
Outlier has since been remounted by Company Wayne McGregor in collaboration with Sadler's Wells, as part of their See the Music, Hear the Dance composer series featuring Thomas Adès. For the Sadler's Wells premiere, Adès conducted his own piece, which was played by Thomas Gould of the Britten Sinfonia. Outlier will once again be performed by Company Wayne McGregor as part of Sadler's Wells Sampled, showcasing a range of diverse dance works and styles. Images of original production by Paul Kolnick. 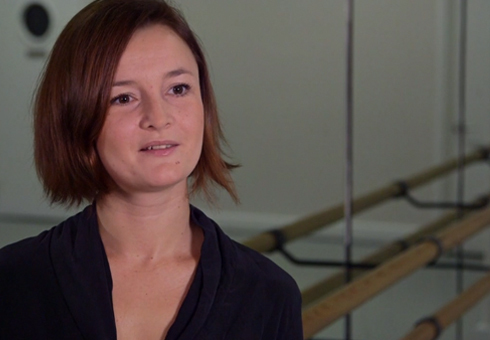 Trailer of Company Wayne McGregor production for Sadler's Wells.